Uppsalas Anders Ångström uppmärksammas vid gata i Kolkata Läs här en artikel från tidningen "The Statesman" om den lilla optikerbutiken som fått namnet "Ångström". 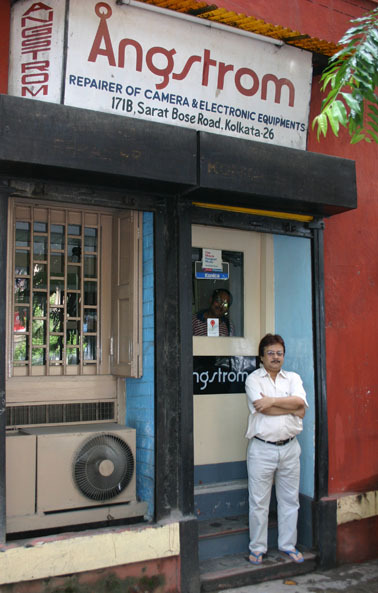 You might pass the small sequestered shop on Sarat Bose Road without noticing it but the name, Angstrom, click your memory. The unit for measuring the wavelength of light is named after the Swedish physicist. 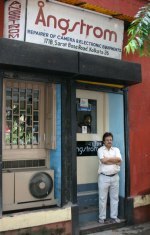 The owner, Asim Chatterjee, learnt his craft at Latif Camera Works during the 1961s. His son, Abhijit, is a master in computers. They do not take photographs. Nor do they sell or make cameras. They are simply repairers and their knowledge of the working of cameras, projectors, binoculars, and everything seen through lenses, is amazing. In our consumer age manufacturers want their equipment to be discarded once it starts giving trouble. Foreign companies no longer bring out manuals. So the Chatterjees have to work by instinct and experience, and quite a few of their customers are from abroad where their fame has spread. "no one is willing to repair in America", says Abhijit, "or only at a heavy cost". Angstrom does not fleece or harass customers. Recently members of a family visiting Calcutta were astonished when Asim opened their camera which was giving trouble, spent about twenty minutes examining and cleaning the parts, put them together, and said "There is nothing wrong with it. No charge". And hey presto! The camera worked perfectly well thereafter. Quite clearly the Chatterjees are good workmen and bad businessmen. They are Bengali bhadralok in the best sense, rapier earning goodwill than looking for the fast buck that everyone chase today. Vid Uppsala Universitet finns sedan 2011 Forum för sydasiatiska studier. Syftet är att stärka forskning och utbildning om Sydasien och att öka Uppsala Universi-tets samarbete med Sydasien. Länk. (Om företagaren som pluggade teknisk fysik i Uppsala).